You’re Only 2 Steps Away from Quitting for Good! Harmless Cigarette is a therapeutic quit smoking solution and natural stop smoking remedy which is very helpful and useful for relieving sudden cravings and help make quitting easy. Harmless Cigarette is also a healthier and safer alternative to smoking, vaping and using nicotine aid products. Click below to learn more about Harmless Cigarette works. HOW DOES HARMLESS CIGARETTE WORK? Harmless Cigarette works by using a breathable air based filter which replicates similar features of a real cigarette that’s designed to help you overcome the urge to smoke and satisfy cravings. It focuses on satisfying both the psychological & physical “hand to mouth” addiction which most smokers find difficult to overcome when quitting. Harmless Cigarette can be used as needed to help cope with quit smoking symptoms and offer relief when quitting for various smoking behaviors associated with smoking. You don’t light it and you don’t charge it. 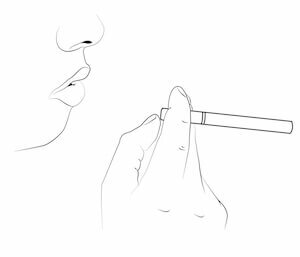 No smoke or vapor is inhaled or exhaled, and it can be used anytime, anywhere, including non-smoking areas! THE PURPOSE AND BENEFITS OF USING HARMLESS CIGARETTE. The purpose of Harmless Cigarette is so you can enjoy a refreshing, relieving and relaxing experience with a natural quit smoking alternative that can help satisfy cravings and overcome the urge to smoke without the harmful effects of smoking, vaping or using nicotine products. TO INCREASE YOUR CHANCES OF QUITTING. 1) You must be motivated and committed to quitting. 2) Use the Harmless Cigarette whenever you get cravings or an urge to smoke. 3) Use the Harmless Cigarette for at least 3-4 weeks when you start to quit, so overtime you can begin to become more familiar with using it as a replacement for smoking. 4) You can use Harmless Cigarette either by itself or together with other nicotine (NRT) products. (Show sketches of patch gum spray etc.) Since Harmless Cigarette is 100% nicotine free it will not increase or interfere with your dose of nicotine. 5) Use Harmless Cigarette with a support program as directed in the enclosed quit smoking support guide booklet. Using Harmless Cigarette is simple & easy. Follow these steps and quick tips for the most enjoyable experience. Remove the protective sealed pouch from the Harmless Cigarette pack. 2. 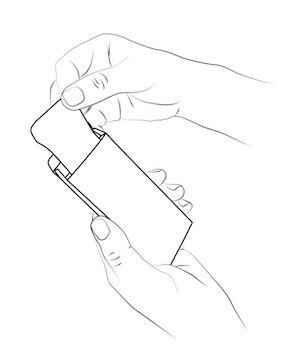 Open the protective sealed pouch to remove the Harmless Cigarette. 3. 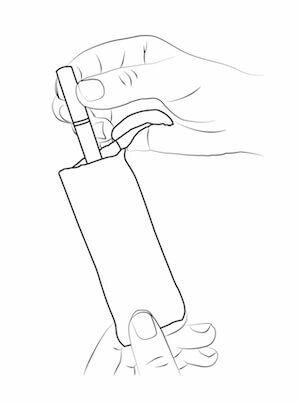 Hold the Harmless Cigarette in your hand between your fingers, or any way that feels most comfortable for you. 4. 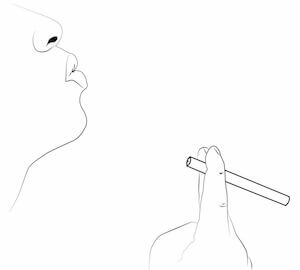 Place the tip of Harmless Cigarette between your lips and take gentle puffs without inhaling into your lungs, similar to puffing on a cigar. Exhale normally through your nose or mouth and enjoy! Take small gentle puffs when you feel cravings or an urge to smoke. NOTE: Breathing plays an important role in keeping you healthy and relaxed. So it’s important to practice breathing exercises by taking several deep breaths of air without inhaling on the Harmless Cigarette. Enjoy with gentle puffs, holding it in your mouth or in your hand to help you overcome the urge to smoke when you feel like having smoking. 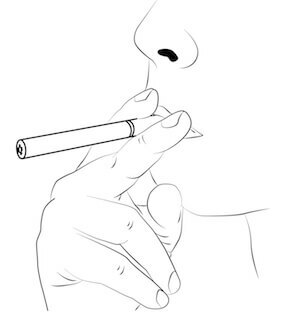 Simply puff on Harmless Cigarette the same way as you would puff on a cigar, and release through your mouth or nose to experience refreshing, relaxing and receiving sensations. (Gentle puffs are sufficient and your mouth does not need to wrap very tightly around it.) No smoke or vapor is inhaled or exhaled.